Successful Film Producing & Financing 2/22 @ Clark Univ. 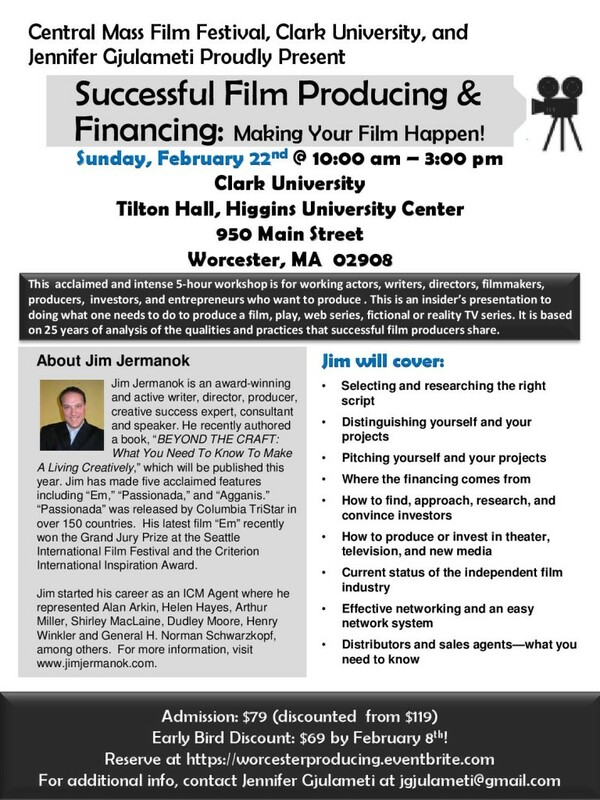 Jim Jermanok’s “Successful Film Producing and Financing” workshop will be held on Sunday, February 22nd at Clark University in Worcester, MA. What are your Oscar dreams? Learn how to make your Oscar dreams a reality and come attend this workshop! It is a no bull, straight talk workshop on film financing and producing, applicable to any creative project — film, TV, web series, theater, music, art, etc. For every one from the aspiring filmmaker to an experienced professional, this workshop is transformative. Purchase your early bird tickets soon! EARLY BIRD DISCOUNT $69 THROUGH Feb. 8th!